When it comes to digital storefronts, Nintendo has always been slightly behind its competitors in terms of looks and usability. Fortunately, a new update has arrived to spruce things up a little. Following the latest Switch firmware update, Version 5.1.0, the Nintendo Switch eShop now has a new ‘Featured’ tab, where players will find a list of 30 games that Nintendo wishes to showcase. The games in this section could be new, coming out soon or even old titles that deserve some more attention. It’s also now possible to choose between viewing ‘All Games’ and ‘Download Only’ games in the store's Best Sellers tab, which should at the very least make it easier to decide whether or not you should bother to go and hunt down a physical copy of the game. 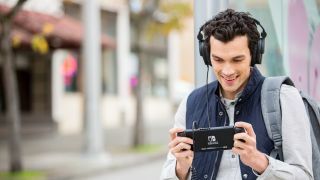 These changes haven’t come as a particularly big surprise – Nintendo announced earlier this year that it was planning to improve the eShop in response to criticisms of its limited discoverability. Though these are small changes, they’re welcome quality of life improvements especially as we’re seeing the eShop grow with digital Switch releases.